With just one month left before the start of the 1st Innompic Games, some teams are still in an early stage of preparation and are not strong enough to perform remarkably. ① Spend a little bit, @everything related to the training will be fully 100% supported by the coordinator. 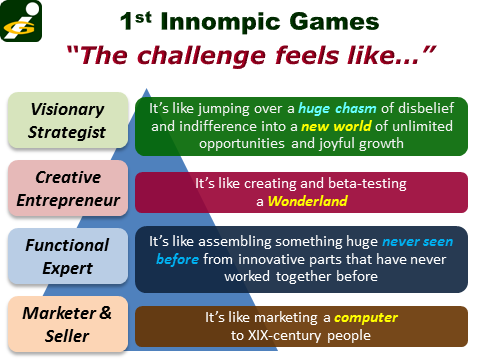 Yet, most prospective partners (sponsors, government, media, controbutors) don't understand the breakthrough value of Innompic Games, that Innompic Games are about A to Z of Innovation 360. They think it's something much smaller, like a hackathon or an invention contest. VIPs, officials, and spectators are busy people who do not see clearly the value in spending 4 days watching teams competing each others. How to make sure the VIPs, officials and spectators are coming to see the game? What value can they treasure, within 4days, beside watching both team compete each others? ② LEARNING: A greater emphasis is put on breakthrough value of Innompic Tools. For instance, over 70% of radical innovation / change projects fail. Simulation game Innovation Football (Innoball) helps such projects not just succeed, but exceed the initially desired results. ③ APPLICATION: The Big Challenges addressed by the Innompic Teams are selected in away to get a wider audience, including VIPs, interested in the 1st Innompic Games. For instance, the ideas, strategies and business models created while addressing the big challenge "World's Best Innovation City" can be impemented anywhere. 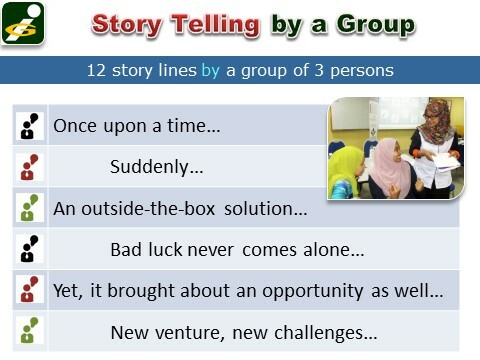 People who came out with great ideas can be invited to implement them in their country or overseas.